During its first episode since David Bowie's death, "Saturday Night Live" aired a touching tribute to the legendary musician. "SNL" alum Fred Armisen returned to the show to remember the artist and introduce a clip from Bowie's 1979 performance of "The Man Who Sold The World" on the show. "When I was in high school and living in Long Island, I stayed up to see David Bowie play on Saturday Night Live," Armisen said toward the end of the episode hosted by Adam Driver. "And watching him was, for me, a life-changing experience." Armisen reminisced about the performance, which featured Bowie wearing a large and stiff costume, joined by German performance artist Klaus Nomi and New York cabaret singer and drag artist Joey Arias serve as dramatic back-up singers. "He had these back-up singers that were like choir singers from the future, and a toy poodle with a TV monitor in his mouth," Armisen said. "David Bowie transformed whatever space he was in, whatever medium he was using, and that night for me, he transformed live television." 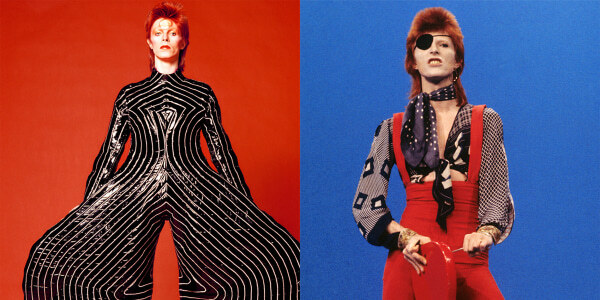 A look back at the inimitable rock star's many faces and fashions. Bowie died last Sunday after an 18-month battle with cancer just two days after his 69th birthday, during which he released his 25th studio album, "Blackstar". He is survived by his wife of 23 years, Iman, their daughter Alexandria, and Duncan Jones, his son from his previous marriage with Angie Bowie.